Boric acid is a chemical compound with a wide variety of industrial and domestic applications. It commonly forms an ingredient of many pesticides (against insects, weeds, fungi, etc.) and certain wood preservatives. Boric Acid Poisoning is the accidental or intentional intake of any product containing the compound. What is Boric Acid Poisoning? Boric Acid Poisoning may be also referred to as Borax Poisoning and Boric Acid Toxicity. What are the Causes of Boric Acid Poisoning? What are the Signs and Symptoms of Boric Acid Poisoning? The signs and symptoms of Boric Acid Poisoning can vary from one individual to another. It may be mild in some and severe in others. Several systems of the body may be affected. Infants and young children may be severely affected. How is First Aid administered for Boric Acid Poisoning? Who should administer First Aid for Boric Acid Poisoning? 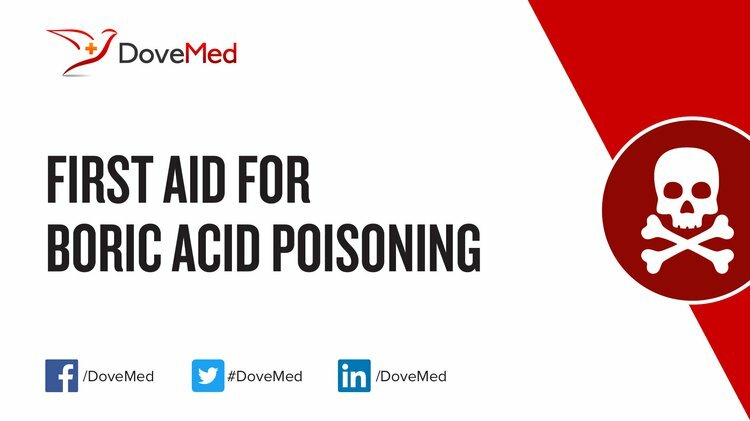 First aid for Boric Acid Poisoning is administered by healthcare professionals. What is the Prognosis of Boric Acid Poisoning? How can Boric Acid Poisoning be Prevented? Padovan, G. J., Leme, I. A., Fassini, P. G., Junior, N. I., & Marchini, J. S. (2014). A New O-phthaldialdeyde (OPA) Solution for Fluorescence HPLC Amine Group Detection without Boric Acid Preparation. Journal of Chromatography & Separation Techniques, 5(3), 1. Topal, A., Oruç, E., Altun, S., Ceyhun, S. B., & Atamanalp, M. (2016). The effects of acute boric acid treatment on gill, kidney and muscle tissues in juvenile rainbow trout. Journal of applied animal research, 44(1), 297-302. Jiráková, A., Rajská, L., Rob, F., Gregorová, J., & Hercogová, J. (2015). Dermatitis toxica faciei after boric acid. Dermatologic therapy, 28(1), 52-55. Soltani, M., Shetab-Boushehri, S. F., Mohammadi, H., & Shetab-Boushehri, S. V. (2013). Proposing boric acid as an antidote for aluminium phosphide poisoning by investigation of the chemical reaction between boric acid and phosphine. Journal of Medical Hypotheses and Ideas, 7(1), 21-24. Duydu, Y., Aydın, S., Undeger, U., Yavuz Ataman, O., Aydos, K., Düker, Y., ... & Maximilian Bolt, H. (2016). Is boric acid toxic to reproduction in humans? Assessment of the animal reproductive toxicity data and epidemiological study results. Current drug delivery, 13(3), 324-329. Johnson, K., Stollings, J. L., & Ely, E. W. (2017). Breaking Bad Delirium: Methamphetamine and Boric Acid Toxicity with Hallucinations and Pseudosepsis. Southern medical journal, 110(2), 138-141. Pointer, B. R., Boyer, M. P., & Schmidt, M. (2015). Boric acid destabilizes the hyphal cytoskeleton and inhibits invasive growth of Candida albicans. Yeast, 32(4), 389-398. Webb, D. V., Stowman, A. M., & Patterson, J. W. (2013). Boric acid ingestion clinically mimicking toxic epidermal necrolysis. Journal of cutaneous pathology, 40(11), 962-965.